You’ll see some of the most famous temples, including the Temple of unique architecture. The Chiang Mai city is defined by a 700 year old moat, sits in the shadow of a monastery built in the 14th century and is dotted with temples raised by kings in centuries long past. In ancient times kings built temples (called wat in Thai) to demonstrate not only their devotion, but also their wealth and power. Temples served not only as centres of faith, but also as schools and hospitals. Today, temples are still a central part of Thai life and the holy structures of Chiang Mai are living, breathing places that serve as invaluable bridges to the past, keeping the people linked to the timeless traditions of their ancestors. 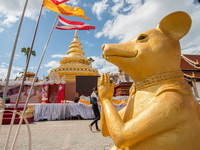 You will discover many interesting temples to see and explore in Chiang Mai and North of Thailand which needs to be carefully planned, however, for now we will tell you about some of the most famous temples highly respected and worshipped by all Thai people and the local people of the region. When you go, remember that a temple isn’t just a tourist attraction. Most of Chiang Mai’s Buddhist temples are there to serve Buddhist and the community, so you’ll be expected to wear modest clothing and be quiet. Nearly all Buddhist temples in Chiang Mai are free or ask for a donation. Wat Phrathat Doi Suthep is a Buddhist temple in Chiang Mai Province, Thailand. The temple is often referred to as “Doi Suthep” although this is actually the name of the mountain it is located on. The temple is located 15 km from the city of Chiang Mai and is a sacred site to many Thai people. Wat Phra Singh Worawihan contains supreme examples of Lanna art. A chedi was first built by King Pha Yu (r.1337-55) to house the bones of his father King Kam Fu (r.1328- 37). The original name of the temple was Wat Li Chiang Phra but this was changed to Wat Phra Singh when the Phra Sihing Buddha image was first housed there in 1367. All those who are interest in sightseeing in Chiang Mai must visit Wat Chedi Luang, Chiang Mai which is the most impressive temple in the region. The temple is around six centuries old. The Wat Chedi Luang, Chiang Mai Thailand gets its name from the huge chedi in the temple. 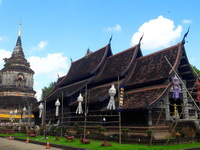 The Wat Phan Tao is one of the older temples of Chiang Mai found in the old walled center of the city. The first structures were likely built towards the end of the 14th century. Constructed entirely of moulded teak panels fitted together and supported by 28 gargantuan teak pillars, the viharn (monastry) is one of Chiang Mai’s precious treasures. 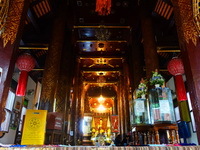 Lok Moli Temple is a historic temple located in Muang County of Chiang Mai. It is over 500 years old. Now that you arrive at Lok Moli Temple, there are lots of important architectures , mostly Lanna style, within the area, all of which you should never miss. Speaking of the most outstanding tourist attractions in Chiang Mai, surely we can never skip this one, ‘Sri Suphan Temple’, as the temple has something really unique and valuable. The main highlight of the temple is this Silver Ubosot. Ket Karam Temple is quite well-known, because it is the storage of the Buddha’s relics ‘Chedi Kade Kaew Chula Manee’, which is a valuable archaeological evidence. And, for your information, the relics is the fortunate symbol for whoever born in year of the dog. Wat Chaimonkol Chiang Mai is one of the greatest ancient temple in Chiang Mai Province. Most people, both Thai and foreign, respect Chaimongkol Temple. The most outstanding appearance of it is the Burmese-Mon style of decoration. And that makes the temple became well-known. The temple is beautiful and peaceful. 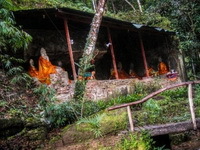 Located in a grove Wat UMong (Tunnel Temple) is a practicing meditation temple. The origins of the temple, which are traced to the 14th century, are obscure. The temple may have been founded by King Mangrai himself to accommodate some forest monks from Sri Lanka. Jed Yod temple is located on the highway which rings Chiang Mai, not far from where it intersects Huay Kaew road. It is also very near (within walking distance) of the Chiang Mai National Museum. Pa Lad Temple is a historic temple, with over 500-year-old stories. It is one of the three forest monasteries within the area of Doi Suthep-Pui National Park. The atmosphere at this monastery is absolutely relaxing. If you don’t know what to do on your holidays, you may choose to take a sightseeing at Pa Lad Temple. Or, if you feel nervous, you may want to practice Dhamma too. Wat Ku Tao is best known for it’s unique chedi, resembling stacked-up watermelons. The chedi was built in 1613. The name ‘Ku Tao’ comes from the northern Thai word ‘tao’ for melon. The temple’s chedi is noteworthy for its unusual, bulbous pagoda. The structure is decorated with colourful porcelain tiles and represents five Buddhist monk’s alms bowls. One of the things that make Phrathat Sri Chom Thong Temple so important is, this temple is the storage of a part of Lord Buddha’s relics.As soon as you arrive at this temple, you will feel surprised so much that you may stop breathing, as the temple is located on a 10-metre-high hill. Therefore you will be able to the clear sky, trees, and other kinds of beautiful scenery. The temple at Doi Saket is similar to the Doi Suthep Temple, yet smaller in size. The entrance to the temple (as is the case at Doi Suthep) has a steep set of stairs leading to the temple. 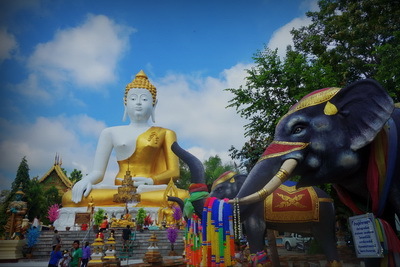 The most prominent feature of the Doi Saket Temple is the giant golden sitting Buddha (Phra Buddha Pathimakorn), visible from the road leading to the temple. The interior walls of the temple are decorated with modern spiritual murals. Wat Rong Khun is one of the most significant temples in Chiang Rai. It features an elegantly refined architectural design in white, which will splendidly glow when the sun shines upon. The temple holds many Buddhist didactic symbols that can teach travellers who visit here. Acha Thong Forest Monastery is quite interesting, because, normally, monks always walk on their feet for Binthabat. Therefore, villagers who pay their respect to Kruba Nua Chai have been talking about what he does. From that point, other monks started to ride on horses for Binthabat too, just like Kruba Nua Chai. And that created a unique appearance for the monastery. 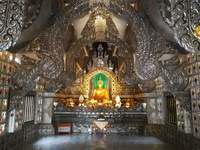 Most tourists, both Thai and foreign, travel to Acha Thong Monastery frequently, in order to see this memorable image. Wat Phra That Doi Kong Mu is the sacred temple of Mae Hong Son province for a long time. The temple is located on a hill to the west of Mae Hong Son city and it is a major provincial landmark. Phra That Doi Kong Mu Temple is famous for its view of the valley it overlooks. This is one of the ‘iconic’ views of Thailand you often see on postcards and it is a genuine spectacle. Wat Jong Kham and Wat Jong Klang are just like twin temples. They are located in the same area situated at the center of Mae Hong Sorn City. They are considered as a cultural identity of Shan culture of this city. In addition to their magnificent art both of them are the centers of cultural activities of Mae Hong Sorn people. Wat Phra That Mae Yen is quite nice, with beautiful panaaramic view of the pai valley and rice paddies. There is a beautiful Big Buddha Statute on the hill. The 353 steps long staircase to reach the temple is charming and beautiful place. It is nice hike to get there and you can get a nice view as reward. The exact year of construction of Wat Phrathat Hariphunchai is unknown but it was built in the reign of King Athittayarat, a descendant of Queen Chamathewi, around the year 1100. Wat Phrathat Hariphunchai has undergone much repair and renewal and in 1443 King Tilokarat, the King of Chiang Mai added 5 new pagodas in the Sri Lankan style. Wat Jamdevi is also known as Wat Kukut, this temple contains two chedi in the Dvaravati style, almost the only such structures left in the country. The larger chedi is made of laterite and has five levels, with three Buddha figures on each side of each level. The stucco decoration around the Buddha images is particularly outstanding. Wat Phra That Lampang Luang is a traditional symbol of Lampang. The temple itself is gorgeous – much of it in old timber, including the painted panels around the sides. If you wanna impress and learn about complete, perfect lanna architectue, this temple and surroundings are the most worthing place to visit; the main monastary is very beautiful with invaluable artefacts, amulets, buddha images and statues. One of the newest amazing places to visit in Thailand that you should check it out!!! That is Wat Chaloem Phra Kiat Phrachomklao Rachanusorns. The mountain has been a Buddhist pilgrimage site for many years, due to a feature believed to be a footprint of Bhudda made over 2000 years ago. This temple started construction in 2004. The construction is still on going since then but most main buildings are finished.